Pizza Nation uses their own specialised couriers to deliver their food. Chicken tikka, salad, garlic and chilli sauce. Cheese, capsicum, mushroom, ham, bacon and salami. Cheese, spring onion, capsicum, pepperoni and jalapeno peppers. Cheese, Spanish onion, capsicum, mushroom, fresh tomato, pineapple, kalamata olives and pesto. Cheese, fresh tomato and pesto. Cheese, Spanish onion, ham, bacon and beaten egg. Cheese, Spanish onion, ham, capsicum, fresh tomato and egg. Cheese, ham, bacon and salami. Cheese, fresh tomato, capsicum, mushroom, onion, olives, bacon,ham,salami and anchovies. Cheese, Spanish onion, mushroom, pineapple and marinated chicken breast with a drizzle of BBQ sauce. Cheese, Spanish onion, capsicum, fresh tomato, kalamata olives, chilli flakes and marinated chicken breast with herbs. Cheese, fresh tomato, ham, pineapple and marinated chicken breast. Cheese, Spanish onion, mushroom, sumac and marinated chicken breast. Cheese, fresh tomato, prawns, bocconcini, garlic and herbs. Cheese, spring onion, prawns, chilli flakes, garlic and herbs. Cheese, tiger prawns, smoked oysters, anchovies, garlic and herbs. Cheese, Spanish onions, capsicum, fresh tomato and marinated lamb on a tomato base drizzled with our homemade tzatziki. Cheese, large prawns, tender calamari, anchovies, garlic, herbs and oysters. Cheese, fire roasted capsicum, marinated artichoke, salami, charred eggplant and feta. Cheese, roast potato, fresh tomato, feta, garlic, herbs, garnished with rocket and pine nuts. Cheese, fresh tomato, sujuk (Turkish sausage) and olives. Cheese,fresh tomato, roasted capsicum, onion, bacon, chicken and herbs. Cheese,fresh tomato,capsicum, onion and cajun chicken. Chicken breast with chips, salad and choice of mushroom and gravy or pepper sauce. 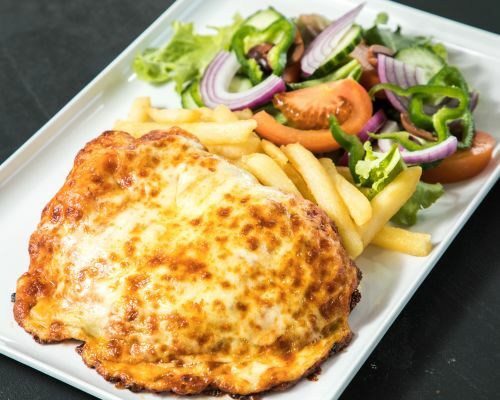 Chicken breast topped with tomato sauce and cheese, with chips and salad. Chicken breast topped with tomato sauce, cheese and jalapeno with chips and salad. CHicken breast topped with bologneses sauce and cheese with chips and salad. Chicken breast salami, bacon, ham, topped with homemade Napolitana sauce and cheese with chips and salad. Traditional homemade rich tomato sauce, minced beef with spices and herbs. Marinated chicken pieces, pan fried in garlic, shallots, semi-dried tomatoes, spinach, cream and fresh basil. Seafood mix of succulent prawns, tender calamari, baby clams and mussels in our rich Napolitana sauce. Fire roasted capsicum, Spanish onion, mushroom, garlic, shallots, fresh tomato and herbs. Fried chicken with Spanish onions, fresh mushroom, shallots, garlic, roast capsicum and black pepper in a rose sauce.